Using different types of textures for maximum effect | Interior Design Malta – Gemini Design Studios Ltd. The setting is an apartment in a new development tucked away down an alley in Zebbug, Malta. 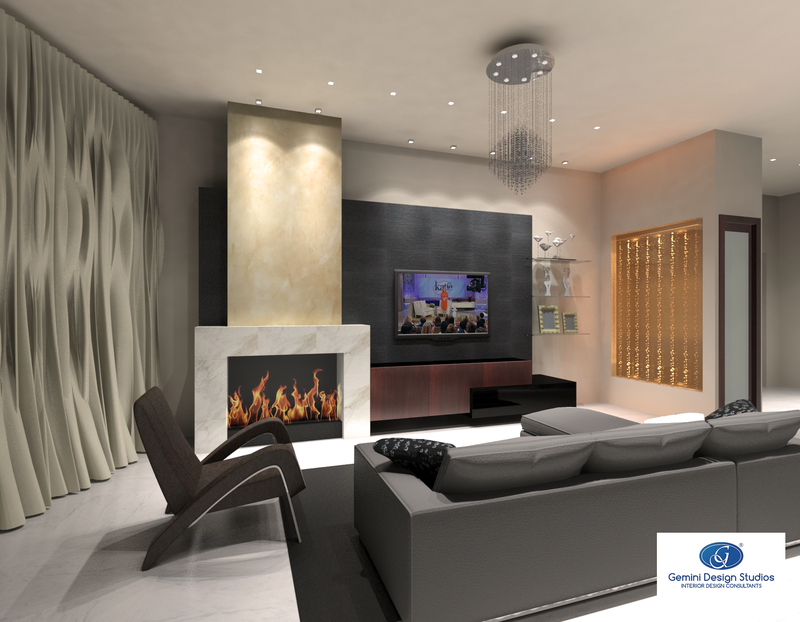 The clients wanted to convert their open space in an elegant yet modern chill-out pad. The targeted rooms were the kitchen, dining and living room. For the living room, a mixture of hard surfaces were chosen to create a sense of texture, blended down with the warm feel of veneziano plaster washed with mediterranean colours, coupled with the warmth of the real wood fireplace. As for the kitchen we provided a choice of ash wood mixed with tones of stainless steel features against a background of mild grey for a true effect. The dining room was provided with a glass extendable table with plush chairs, adorned with a modern crystal chandelier for directional lighting. For maximum effect we inserted a large mirror adorned with floral wall decals and a floating cocktail cabinet to enhance light and a spatial feeling for that particular area.